Most of us experience a stiff neck once and awhile after a restless night’s sleep or from sitting at a computer desk for too long. Generally, a stiff neck is regarded as a normal condition that can be treated at home. The characteristics of stiff neck may include pain and difficulty moving the neck from side to side. A stiff neck is also one of the causes of pain in the back of head. Symptoms don’t usually last longer than a few days and can be managed using the protocols below. One minute is all it takes to knead away neck pain with this technique. Start by determining what side of your neck the pain is on. If it’s located on the left side, use your left hand. If it’s on the right, use your right hand. Use your fingers to press directly into the pain or knot until you feel a good amount of pressure, but not a sharp pain. Turn your head in the opposite direction of the pain and diagonally bend your chin down toward your armpit. Repeat these steps about 15-20 times in a row. Repeat throughout the day to keep your muscle relaxed. Applying pressure to the sore spot while activating the muscle may help deactivate the pain. If you can’t reach the pain, try placing a tennis ball at the site of the pain and leaning against a wall to create pressure. If this doesn’t help, try the techniques below. If you also suffer from a back pain, try these yoga stretches to sooth back pain. To reduce tightness, pain in base of skull and inflammation, try massaging your neck for several minutes to relax the muscles while increasing blood circulation. You can also massage with essential oils that are good to relieve pain and inflammation, such as peppermint essential oil, which contains natural analgesic properties that naturally reduce pain. Peppermint also contains methanol that helps naturally soothe sore muscles. Start by relaxing your muscles by taking a hot shower or bath. Mix a tablespoon of carrier oil such as coconut or olive oil with a few drops of the peppermint oil and massage the affected area in firm yet gentle strokes for several minutes. If you can’t reach the pain, try asking a friend or a family member for help. If you are interested to learn more about essential oils you can find useful information in my e-book Magical Aromatherapy which will help you to discover the power of essential oils and the most effective ways to use them. According to studies, the muscles in your neck need exercising too. That’s how they get strong! Head rolls are a great place to start. They can be done virtually anytime you feel soreness coming on. Slowly roll your head clockwise to determine how much of your peripheral view you can see. After circling several times you may notice that you can see further. Switch directions after 4 or 5 rolls. Always be sure you have correct posture anytime you move your neck or head. Another exercises you can do for several minutes are tilting your head toward your chest and backward toward the ceiling, or tilting your head down toward your left shoulder and then toward your right shoulder or slowly turning your head and looking to the left and then looking to the right without turning your body. Heat therapy can be used to increase blood circulation, decrease muscle pain or spasms and increase motion and flexibility. Try applying a heating pad, a warm compress or a damp towel on the affected area for 20 minutes. Be sure to wrap the source in a towel before applying it to your neck to protect the skin. Some people use cold therapy to numb the pain, such as ice packs, a bag of frozen vegetables or an ice towel in order to reduce swelling and pain immediately after injury for acute pain or a new and recent swollen and inflamed injury. However cold therapy is not recommended for stiff muscles or joints. For more information about heat and cold therapy, see my article on when to use cold or heat therapy for pain, stiff muscles and joints. Epsom salt is composed of magnesium sulfate, a chemical compound that helps ease sore muscles. It may also reduce stress and tension by improving circulation. To take an Epsom salt bath, fill your bathtub with warm water. Add in two cups of Epson salt and soak in the tub with your neck submerged in the warm water for 15 to 20 minutes. This can be done up to 3 times per week. Epsom salt has many other uses which you can read about in my article about the most extraordinary uses for Epsom salt. According to one medical review activation of specific pressure points could help relieve pain at the local site as well as pain from other parts of the body. Pressure points in your hand can help alleviate neck stiffness that is caused by poor posture. 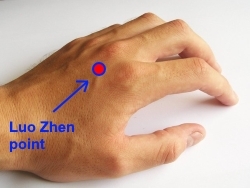 Luo Zhen is a term that describes an acupressure point in the hand that can bring immediate relief to neck pain. The point where you need to apply pressure is located at the back of the hand in between the two bones in the depression just past the knuckles of the pointer and middle finger. If your neck pain is located on the left side, then apply pressure in the form of small circles to this point on your right hand – it means that you need to massage the point on the opposite side of the body from the neck pain. Massage this point by pressing into it with the tip of your finger and making tiny circles. Use enough pressure to feel slight tenderness at the point. While applying pressure on your hand, also try rotating the neck from side to side to loosen the muscles. You should notice the pain reducing while your flexibility increases. Wacky sleeping positions seem to be a common cause of neck stiffness or shoulder pain at night. Make sure to sleep on your side or on your back but not on your stomach (you can read more about the best and worst sleeping positions for your health). If you still prefer to sleep on your stomach, be mindful of the pillows you use. Pillows that are too large may push your neck too far to the other side when sleeping on your side. Your pillows should be no larger than the space needed for your head to lie flat without curving up. You can even train yourself to sleep properly with no pillows. Feel the natural alignment of your head and neck position without the influence of pillows. When you sleep, make sure your head and neck are properly aligned with the rest of your spine. To avoid waking up in pain, make sure you aren’t sleeping directly in the path of cold air. This can cause the neck muscles to tighten.